“Lehigh researchers have collaborated with colleagues in China and at three national laboratories in the United States to develop a gold-based catalyst that they believe could improve the performance and efficiency of fuel cells that run on hydrogen. 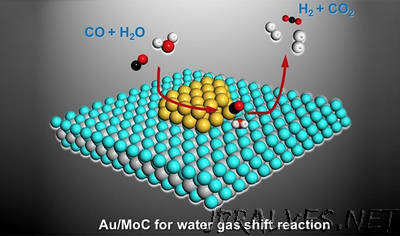 Writing in Science magazine, the group said its catalyst—comprising raft-like gold nanoparticles on a special type of molybdenum-carbide (α-MoC) substrate—had achieved a high level of activity at low temperatures while producing the pure streams of hydrogen necessary to power fuel cells. The researchers said they achieved their results by utilizing the water-gas shift (WGS) reaction, which converts carbon monoxide (CO) and water into hydrogen (H2) and carbon dioxide (CO2). The group was able to purify the hydrogen by using up all available CO, which tends to deactivate fuel-cell catalysts. The WGS reaction, which is typically used to make hydrogen for the manufacture of chemicals like ammonia, is also a critical part of the effort to transition from hydrocarbon-based fuels to hydrogen. Kiely said the use of the α-MoC substrate—an innovation by Ding Ma and his colleagues at Peking University in China—enabled the group to overcome shortcomings previously reported with catalyzing the WGS reaction. In addition to Kiely, the paper’s authors include Li Lu, a Lehigh Ph.D. candidate, and Wu Zhou, who earned his Ph.D. at Lehigh in 2010 and is now a professor at the University of the Chinese Academy of Sciences in Beijing. The other authors are affiliated with Peking University, Dalian University of Technology, Synfuels China and Taiyuan University of Technology, all in China, and Oak Ridge, Brookhaven and Lawrence Berkeley National Laboratories in the U.S. The lead scientist in the work is Ding Ma, a professor in the College of Chemistry and Molecular Engineering and the College of Engineering at Peking University in Beijing. To achieve high catalytic activity at low temperature (i.e., below the 150 degrees C. needed to efficiently operate a fuel cell), the group dispersed the gold onto a carbide (α-MoC) instead of the iron oxide, cerium oxide or other reducible oxide substrates previously tried for the WGS reaction. The new catalyst formulation proved more stable than conventional catalysts, while achieving much greater activity, a measure of a catalyst’s efficiency. “The beauty of the α-MoC support,” said Kiely, “is that it can activate the water so that it creates active surface hydroxyl (OH) species, which can then react with the CO to give hydrogen and CO2. The carbide support therefore plays a very strong and critical role in this reaction. In studies done with Lehigh’s aberration-corrected scanning transmission electron microscope (STEM), the group demonstrated that the gold exists in two distinct forms on the α-MoC support. “The microscopy has shown that the gold exists as nanoscale rafts just a few atoms thick and also as individual gold atoms dispersed over the support,” said Kiely, who directs Lehigh’s Electron Microscopy and Nanofabrication Facility. The article is the ninth Kiely has published to date in Science; he has also published four in Nature. The two publications are considered the world’s leading science journals. Earlier this month, Kiely received one of the highest honors in his field when he was inducted as a Fellow of the Microscopy Society of America. The MSA Fellow designation annually recognizes senior distinguished members of the society whose achievements and service have made significant contributions to advancing the fields of microscopy and microanalysis.